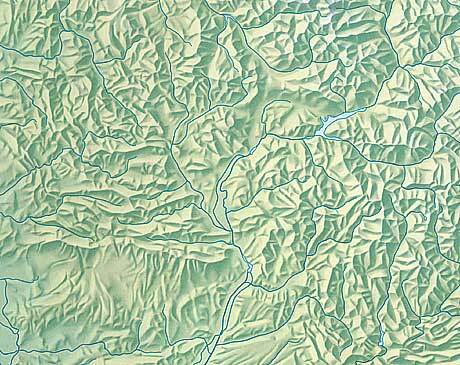 Swisstopo (Federal Office of Topography) is world famous for the quality of its official map series. Swisstopo’s shaded reliefs contribute to this fame. A small group of specially trained relief cartographers at swisstopo is responsible for the shaded reliefs. Relief, sheet 1170 “Alpnach” by Rudolf Morf, original scale 1:25,000 (size 78 × 57 cm), 1995, © swisstopo. It took Rudolf Morf about 300 hours to complete the original relief shading “Alpnach” (image size 70 × 48 cm). The shaded relief is incorporated behind the printed map, brightened and additionally enhanced with a light tone (yellow tone). Such an original relief exists for every single Swiss map sheet of the various provided scales – about 350 in total. swisstopo employs the airbrush technique. “Carte du relief des Alpes” (section from the southern French Alps), original scale 1:1 million (size 124 × 85 cm), © swisstopo. The swisstopo map with the smallest published scale is the “Carte du relief des Alpes” (displayed above). It is a mute map (i.e. without lettering), only containing a coloured relief shading with hydrographic, but no other topographic or thematic features. The relief depicting the whole alpine area was created in the years 1992/93 in two halves. 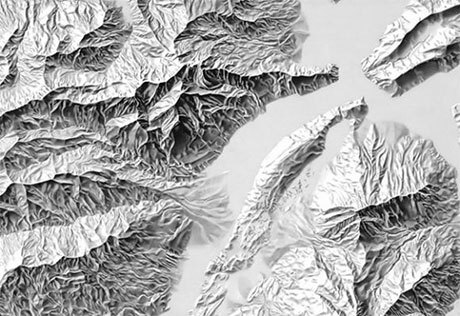 Relief cartographer Paul Ehrlich used a brush for the mountain edges and an airbrush for the mountain slopes. The relief was created on silver bromide paper with Pelikan ink. Contour lines served as a base.